Is it Bedtime yet? : A Busy Day. The rugrats and I have been keeping busy this weekend. On Saturday after Alex's dance class, we met some friends at a local pick-your-own strawberry farm. 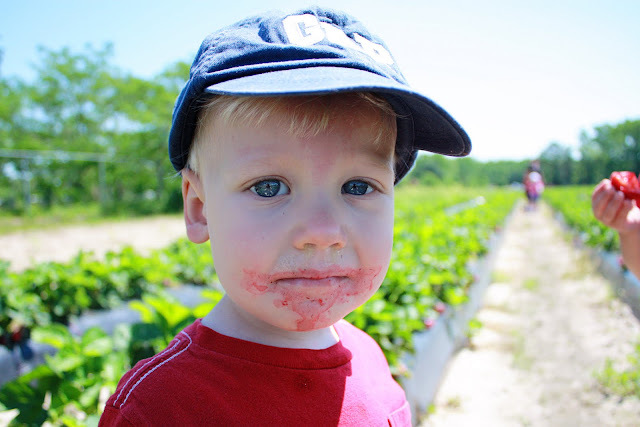 What could be more fun than 6 kids, ages 5 & under, running wild through a field of strawberries? Well, probably lots of things. True fact: despite appearances to the contrary, none of the children in that last picture are twins. The little guy in the front belongs to my friend Alyssa. She is pregnant with her second boy, and she was able to wear her normal jeans AND BELT to her 20 week ultrasound appointment. I'm not sure we can be friends anymore. Her oldest, Kaylynn, is Alex's good friend and is almost exactly one year older than her sister, Emily. And despite the fact that Alex could rest her chin on the top of Kaylynn's head, Alex is just 8 months older than her. They are both classic firstborns, who like things their way. They battle it out for the alpha dog position. It was a gorgeous day! This whole weekend has been wonderful-- mid 70's, low humidity. Alex only let me get a few picture of her before she took off for the other side of the field. Derek wouldn't let me get more than a foot away from him. He needed constant reassurance that yes, that is a great strawberry and why don't you go ahead and pick it. He usually doesn't like to get his hands messy (I know! Weird kid! ), so I loved seeing his grimy little paws crushing the crud out of strawberries. He is also typically not my fruit-eater. It must have been backwards day. Little Andrew liked them too. Green tops & all. This is my favorite picture of the day. This little guys is Kaylynn & Emily's brother, also named Andrew. He's a little flirt, and he really is just a sweet baby boy. Afterward, we took our messy crew to Chik-fil-A for lunch. Then home for naps*. *this word is never meant to indicate that any children actually slept, because in all likelihood they did not. And look what happened during faux-nap time! Do you let Derek eat Chick-Fil-A? What do you get for him? I do let Derek eat there, Jennifer. The fries are no longer cooked in peanut oil, and he can eat their grilled chicken breast. I was concerned initially about him playing in the play area w/ all the greasy hands in there, but we've never had a problem. No hives, or any reactions. Love it, I remember taking you and Corie to the strawberry man. He always said the same thing, guess you in weigh you out. I know you ate more than you ever put in a bucket. Are you going to make jam? The strawberry freezer jam is really good and so easy...it practically makes itself! I hope to pick strawberries here this year. Sadly I will not have any little helpers. Sigh.